My poor, neglected second child, Healey doesn't have a nursery. She doesn't have a room. I am changing diapers on our spare dining room table and a lot of nights, she just sleeps snuggled on my chest in my bed. Puff and Bimmer have essentially become roommates across the hall from us. I knew The Bungalow wasn't going to be conducive to a second child. Not at first anyway, when having the girls share a room wouldn't be an option. So the entire time I was pregnant, the one and only new contraption that I was set on getting for Healey that Bimmer never had was a Rock 'n Play. Puff assembled it just in time before Healey's early arrival, and I was sure the snuggly shape of it would be the perfect place for Healey to sleep in our room for the first few months. Especially after so many moms I know swore by it. (Despite a recent rash of articles I saw that said it wasn't the safest product.) But then we got home from the hospital, and that first day, I went to set Healey down in it. And I realized the problems. First off, it was too low for me to even reach to put her into it without assistance after my C-section. I couldn't bend that far south without excruciating pain, so off to snuggle in bed with me she went. When we were finally able to get her into it, I noticed immediately that the angle she was laying was not one I was comfortable with. She felt folded in half, and I was worried she wouldn't be able to breathe properly. Or if she spit up, that she could choke on it. From that minute, I knew that it was definitely not the product for us. But what then? We had just dropped $80 on this thing (with no receipt to be found, of course) and now we needed another option. With no space whatsoever in our room to accommodate going straight to a crib, I was faced with a stressful situation on top of a stressful situation. Not what a new mom wants to have to deal with! Thankfully, my dad came to the rescue and offered to help us out with a bassinet. So we trudged to the baby store with a 5 day old and a 3 year old on a quest to find the right bed for us. 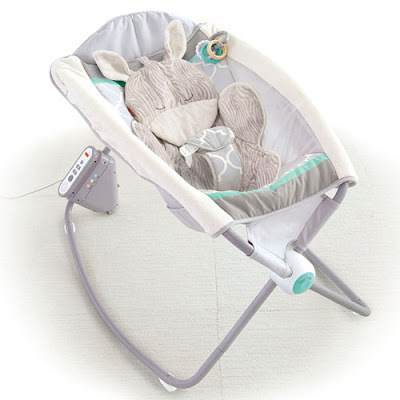 After taking several options down off the shelf to test the heights, sturdiness, and big sister accessibility, we settled on a Chicco travel bassinet. Of course it only came in the most hideous of green colors, but at that point, we didn't care. 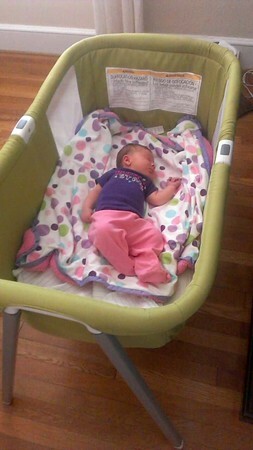 I needed a safe and secure place for my baby girl to sleep... it could have been pink and orange striped for all I cared. Healey did great in it for a few days, then regressed and only wanted to sleep in my arms. We've had a bit of a battle back and forth with her in it at nighttime (which would be easier if she was in her own room, but that's just not going to happen right now) but she is doing a lot better with napping in it contently. Baby steps... I'm OK with that. So, bed disaster averted. It was definitely the right decision for us. Here's hoping they'll at least give us some store credit for the Rock 'n Play when we return it. If not, I suppose it doesn't matter. I can rest easier at night and hopefully soon, Healey will rest through the night in it too.